Plastic. 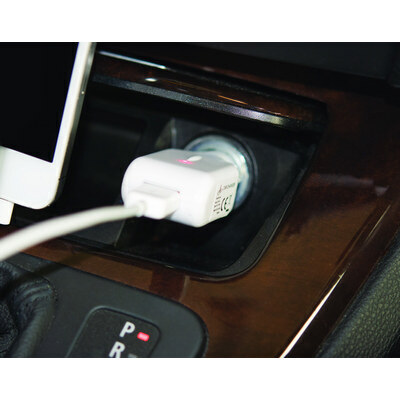 Universal car charger with dual USB port. Input: DC12-24V, Output: DC5V 1000mA. Red LED indicator. Over voltage, over current, short circuit protection. Meets ROHS quality standards. BLACK, WHITE. Product Size: 93Lx33Wx20D mm. Print. Size: 25x15 mm. Price includes : See drop down menu for print options. Setup is additional. Please contact your sales representative for a final quote.